One trillion dollars is the estimated cost of space debris pollution clean-up. Every country that has launched anything into orbit is responsible for the pollution that is growing every year. Space access could one day not be possible, rendering all satellite telecommunications of voice and data compromised. Imagine no global internet. Every object including satellites over 125 miles in altitude will be in orbit for decades and possibly centuries. Unmitigated dispersion of space debris is compromising our global communications and putting our troops at peril. In addition, space debris have been affecting not only the astronauts in the Space Shuttle, but also the space station. National security has been compromised by space debris. Over 135 million pieces of orbiting space debris traveling at speeds in excess of mach 26, or 17,000 miles per hour, have been destroying the Iridium communications satellites, as well as corrupting the GPS constellation satellite signals that support our Predator, Reaper, and other unmanned air vehicles (UAV’s). In the battle ground in Afghanistan, when faced with 200 Taliban, an air strike of Predators, Reapers, and support manned aircraft is needed for our warriors on the ground. Without cell telecommunications from satellites, the mission is compromised; our troops are in jeopardy, unable to call an air strike or reach chain of command to receive intelligence. 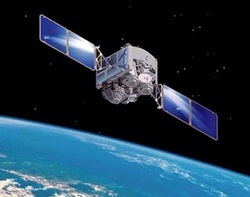 National security relies on global surveillance from satellites that provide telephony, television signals, GPS, as well as global intranet and internet connection. With compromised satellite support, the loss of electronic warfare edge could prove to be disastrous. Terrestrial coalition efforts in the global war on terror could be hampered for years to come. Space debris is a clear and present danger. This was identified in the February 10, 2009, collision between Iridium 33, one of 66 required direct military communications satellites in orbit, and Kosmos-2251, a defunct Soviet military communications satellite 490 miles over northern Siberia. There are immediate and long term solutions required. Space debris has become a menace looming larger and more pressing than questions of global warming, alternative energy solutions, and industrial pollution. A Cosmic Question: How to Get Rid Of All That Orbiting Space Junk? A Cosmic Question: How to Get Rid Of All That Orbiting Space Junk? Crash of U.S., Russian Craft Renews Interest; Lasers? Rocket-Powered Water Guns?By DANIEL MICHAELSIn the 1980s, Jim Hollopeter helped design rockets that shot into orbit. Today, some of those launchers are still cluttering up space, and he wants to wash them away with a rocket-powered water gun. Like many aerospace engineers, Mr. Hollopeter is worried about thousands of pieces of useless equipment circling Earth. Bits of spent rocket boosters, old exploded satellites and tools dropped by space-walking astronauts are just some of the trash racing along in the near-vacuum of space. The volume of man-made space debris has grown so large that scientists say garbage now poses a bigger safety threat to the U.S. space shuttle than an accident on liftoff or landing. The International Space Station occasionally fires thrusters to dodge junk. The problem hit home Feb. 10, when a defunct Russian military satellite smashed into an American one used for commercial communications, spewing shards across thousands of cubic miles. Space flight is a risky business, but the chance of a deadly collision is increasing due to a spreading canopy of junk that's orbiting our planet. And the wreckage from a recent satellite collision is adding to the trash, making more collisions among spacecraft all but inevitable. WSJ's Robert Lee Hotz reports. The crash prompted Mr. Hollopeter to refine designs for a concept he had long toyed with: Using aging rockets loaded with water to spray orbiting junk. His idea is that the extraterrestrial shower would gradually knock refuse down toward the atmosphere, where it would burn up, as would the launcher. The water would turn to steam. "We need to treat space like a national park -- carry out what you carry in," says Heiner Klinkrad, who runs the European Space Agency's Space Debris Office in Darmstadt, Germany, and is chairman of the global Inter-Agency Space Debris Coordination Committee. Dr. Klinkrad, a German aeronautical engineer who monitors European satellites, has long urged governments and commercial space operators to be neat when they launch. He says space agencies should design rockets that don't scatter bolts or straps in space as they release probes. New satellites should be built so they head earthward when their work-life ends, rather than continuing to orbit. Objects lower than roughly 125 miles self-immolate in the atmosphere. Still, limiting the amount of new debris isn't enough. Vast quantities of junk are already parked in space for centuries to come, and many engineers are working on how to get rid of it. 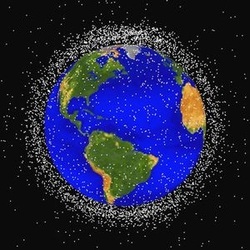 ESAA constellation of trash envelops our planet -- while satellite operators scramble to get out of the way. Johns Hopkins University's Applied Physics Laboratory, a leading space research center, recently conducted feasibility studies into junk-zapping lasers and garbage-collecting rockets. Dr. Klinkrad at ESA is now leading an international space commission that is assessing debris-removal possibilities. He is also organizing two global conferences that will discuss ideas later this month. Experts are also taking a fresh look at the National Aeronautics and Space Administration's 1996 Project Orion, a "space broom" concept to fry space trash with ground-based lasers. When Jonathan W. Campbell started leading the effort, he thought the approach would entail futuristic and impossibly costly technologies. "I thought it would be a Buck Rogers thing," the astrophysicist recalls. Instead, his team concluded that for the price of one space-shuttle launch -- roughly $500 million -- the laser could nudge thousands of bits of garbage toward incineration in the atmosphere within five years. Compared to the cost of losing a satellite or a shuttle to space debris impact, "this looks like a bargain," says Dr. Campbell, who works at NASA's Marshall Space Flight Center in Huntsville, Ala.
A key to his plan is using existing low-power lasers in quick pulses, much like the flashbulb on a camera. The laser would only singe the surface of an object in space, but that tiny burn could still help point it downward, Dr. Campbell says. Project Orion's low-budget approach hits at a conundrum of space debris. Multibillion-dollar budgets have parked people in space, allowed global telecommunications and brought Star Wars military systems within reach. But cleanup missions to pick up all the trash cast off by a launch are prohibitively expensive. "The problem with removing space debris is you don't have any financial benefit from doing it," says Dr. Klinkrad. To rocket scientists, who defy gravity for a living, that's an irresistible challenge. Mr. Hollopeter says he got excited by water-blasting because it's so low-tech. "This is basically the cheapest way I could come up with," says the 61-year-old engineer, who now works for Satellite Communications in Austin, Texas. Mr. Hollopeter's recent work was sparked by a request last November for space-cleaning ideas from Launchspace Training, a space consulting firm in Bethesda, Md. Launchspace ran the project, which drew more than 100 responses, as a promotion and to tap aging engineers with experience from the U.S.-Soviet space race of the 1960s, says director Robert Russo. "There's a magnificent pool of knowledge and talent out there, and I think they're just not being asked," says Mr. Russo. He says Mr. Hollopeter's idea was one of the most original, although nuttier concepts were also submitted by "techno-geeks who read science fiction and know nothing about space." Blown to BitsAmong the suggestions: launching big nets and large magnets to snag refuse, or using high-energy lasers to atomize debris. None of these ideas is feasible. Magnets would be useless because spacecraft contain almost no iron. Nets are almost uncontrollable. Blasting debris, meanwhile, would simply create smaller remains that would be tougher to track and produce a vast haze of shrapnel, experts say. 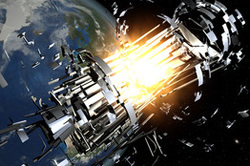 European Space AgencyArtist's rendering of an explosion of a rocket stage, spreading debris. Detritus wasn't an issue back in October 1957, when the Soviet Union launched Sputnik, the first man-made satellite. But within 20 years, concerns about trash were already growing. In 1978, two NASA scientists published a paper predicting "the creation of a debris belt" around the Earth. NASA soon after appointed one of the paper's authors, Donald Kessler, to start a new Orbital Debris Program. 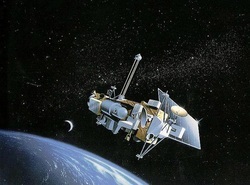 The office began working with other U.S. government agencies to track and analyze orbiting garbage. Dr. Kessler says that from the start, his team examined ways to cleanse space. "They were all science-fictiony kinds of things," recalls the retired astrophysicist in Ashville, N.C. One concept to vacuum up refuse was similar to the Planet Eater, which devoured spaceships in an episode of "Star Trek," he says. Since then, engineers have gotten more serious. In 2003, the Aerospace Corporation, a research center in California, patented plans for an inflatable set of space tongs that could grab and tow objects. They would act like "a hearse for dragging dead satellites to a galactic necropolis," says the patent's author, retired nuclear engineer Ernie Robinson, who lives in Altadena, Calif.
Costs, BenefitsStill, such ideas floundered because the risk of space junk seemed small compared to the cost of removing it. The threat ballooned on Jan. 11, 2007, when China demonstrated its ability to eliminate potential military threats in space by firing a ballistic missile at its Fengyun-1C weather satellite. Instantly, the projectile and the one-ton spacecraft were reduced to roughly 3,000 fragments, increasing the estimated volume of orbiting debris around Earth by about 25%. The Feb. 10 collision almost 500 miles above Siberia added at least 600 more big fragments, specialists say, and refocused attention on the problem. "Debris removal is moving to the front of the agenda," says William Ailor, director of the Center for Orbital and Reentry Debris Studies at the Aerospace Corporation in Los Angeles. One unlikely proposal he frequently hears is using "catchers' mitts and such" -- launching a big ball of foam or clay that could sponge up debris. One hitch is that the blob would have to be huge to make a difference, and so would itself become a threat to live satellites, Mr. Ailor says. With such complexities dogging most space-cleaning ideas for at least the near future, space-debris expert Dr. Klinkrad says the best solution is to follow earthly advise: "Don't litter." That may mean vacuuming up debris with weird space technology - cosmic versions of nets, magnets and giant umbrellas, according to the chairman of an expert panel that issued a new report on the problem. Since the space age began 54 years ago, civilisation has littered the area just above Earth's atmosphere with leftover boosters and other parts that come off during launches, as well as old satellites. When scientists noticed that this could be a problem, they came up with agreements to limit new space junk and those plans had been working. But two events in the past four years - a 2007 Chinese anti-satellite weapon test and a 2009 crash-in-orbit of two satellites - put so much new junk in space that everything changed, the report said. The widely criticised Chinese test used a missile to smash an aging weather satellite into 150,000 pieces of debris larger 1cm and 3,118 pieces can be tracked by radar on the ground, the report said. "Those two single events doubled the amount of fragments in Earth orbit and completely wiped out what we had done in the last 25 years," Mr Kessler said. All that junk that means something has to be done, "which means you have to look at cleaning space", he said. The study only briefly mentions the clean-up possibility, raising technical, legal and diplomatic hurdles. But it refers to a report earlier this year by a US Defence Department science think-tank that outlines all sorts of unusual techniques. The report by the Defence Advanced Research Projects Agency is called "Catcher's Mitt" and it mentions harpoons, nets, tethers, magnets and even a giant dish or umbrella-shaped device that would sweep up tiny pieces of debris. While the new report does not recommend using the technology, Mr Kessler said it is needed. He likes one company's idea of a satellite that is armed with nets that could be sprung on wayward junk. Attached to the net is an electromagnetic tether that could either pull the junk down to a point where it would burn up harmlessly or boost it to safer orbit. The report is from the National Research Council, a branch of the National Academy of Sciences, which is an independent organization chartered by Congress to advise the US government on science.